Marie Severin, longtime Marvel comic book artist and co-creator of Spider-Woman, has sadly passed away at the age of 89. According to The Hollywood Reporter, Severin's death came after a move to hospice care, following her second stroke earlier this week. She suffered her first back in 2007. Her death was announced in a Facebook post by Irene Vartanoff, Severin's friend and former Marvel staff member. 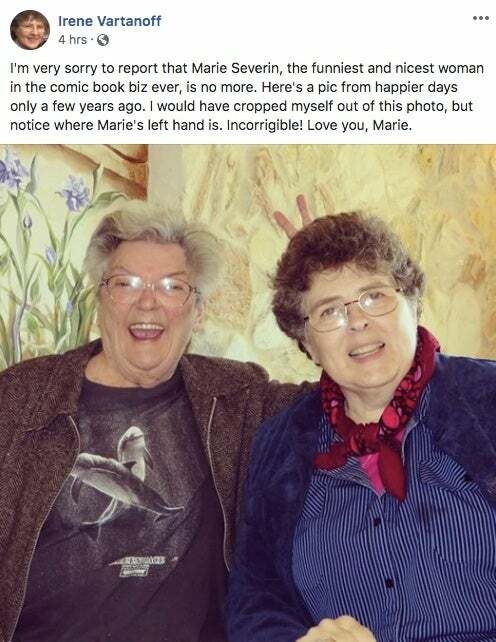 "I'm very sorry to report that Marie Severin, the funniest and nicest woman in the comic book biz ever, is no more," Vartanoff wrote in a post Thursday morning. "Here's a pic from happier days only a few years ago. I would have cropped myself out of this photo, but notice where Marie's left hand is. Incorrigible! Love you, Marie." The post included a photo of the two friends and, as Vartanoff mentioned, Severin is giving her a pair of "bunny ears" behind her head. Severin began working in the comics industry as a colorist for EC Comics with her brother, the late artist John Severin. She continued coloring titles for the company until it went under in the 1950s, which is when she made her move to Marvel Comics. After starting off as a colorist and paste-up artist for the publisher, Severin eventually went on to completely pencil and ink stories. She was promoted to the position of Marvel's head colorist where she served the company until 1972. She then left the position to concentrate on penciling and inking. Severin is well-known for her work with Spider-Woman, as she designed the character's original costume. She also designed and illustrated merchandise for Marvel's Special Projects division. In addition to her work with Marvel, Severin contributed to books for DC, Claypool Comics, and Fantagraphics.